The distinctive shape of Solardome geodesic domes means they are easy to spot and great for adding that ‘wow’ factor to a project. This makes our domes ideal for visual media, so we’re thrilled when we see one on television. Here’s a rundown of some of our most high profile appearances. The 2013 Chelsea Flower Show coverage on the BBC showcased the Gold Medal-winning garden, which featured a SOLARDOME Haven. The BBC team even interviewed garden design expert Joe Swift inside the dome. In 2012 we appeared on the Children in Need DIY SOS special at The Yard in Edinburgh. This aired on BBC1 during the week leading up to the main Children in Need evening. The Yard is an indoor and outdoor adventure centre for children with additional support needs. Three of our staff built a SOLARDOME Retreat in the gardens so that the children could play outdoors regardless of the weather. Our Managing Director, Pippa Bailey, was also interviewed on screen by presenter Nick Knowles. As a keen gardener I was thrilled to see our presence on Gardener’s World in 2012 when the show featured garden designer Charles Rutherfoord’s 20 year old glass dome. It was wonderful to see the dome looking immaculate and still in daily use. In 2008 Channel 4’s Grand Designs covered a project to rebuild a thatched cottage in the New Forest that had almost completely been destroyed by fire. After two years and an enormous amount of work, Alex Reay and Cheryl Robson completed their dream home with a SOLARDOME® Haven as an outdoor room between the organic vegetable beds. Our domes have also been used as a backdrop for other television programmes, largely because of their eye-catching qualities. For example, a bespoke SOLARDOME Sanctuary, being used by the Canadian Tourist Office outside Canary Wharf tube station, starred in the opening sequence of the 2010 series of The Apprentice. The modern geodesic profile of the glass dome fitted in perfectly, surrounded by the soaring towers of Canary Wharf. The appearance I expected least was a shot of our skylight in the Custard Factory, Birmingham, shown in the 2013 crime series By Any Means – especially as it was set in London. My husband said: “Isn’t that one of your domes?” I knew immediately which one it was because the renovation of the former Bird’s Custard factory is so stunning. 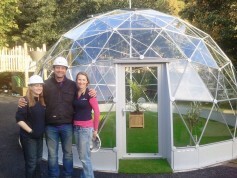 In 2008 the series Dead Set, which was a parody of Big Brother where zombies take over the world outside, featured a SOLARDOME® Haven in the garden. 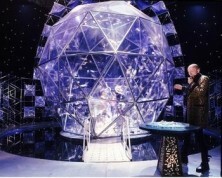 Our longest running appearance was in the game show The Crystal Maze. Where the bespoke 2/3 sphere was specially commissioned for the final segment and used between 1990 and 1995. In both 2006 and 2010, the show was voted ‘Greatest UK Game Show Of All Time”. As a family we used to watch it avidly. Back then I never thought that one day I would work for the company that created the iconic Crystal Dome. Have you seen a Solardome geodesic dome on TV? Or in your local area? If you have, please let us know, or share your photo on our social media pages.